I'm behind on my beer advent calendar postings.. so so what. Plus I won't be adventing it up much after Thursday as I'll be in Jamaica!! 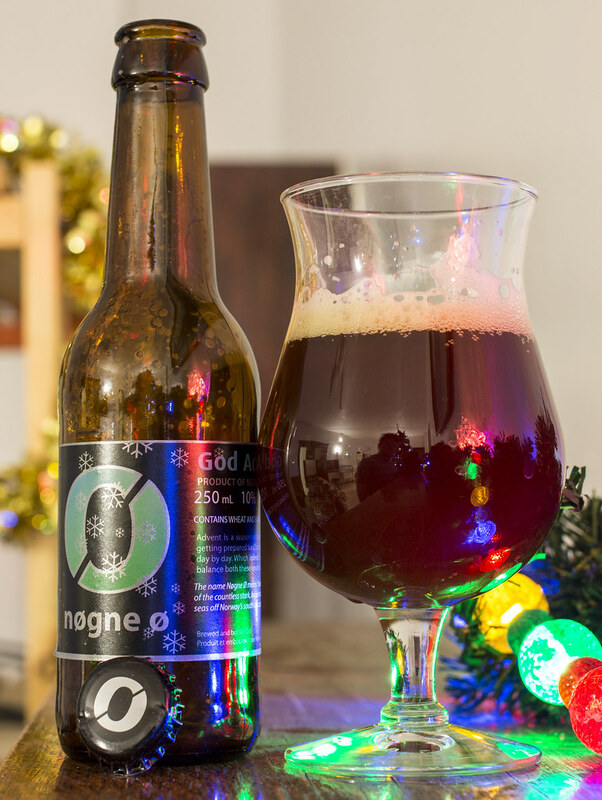 December 1st's beer from the Craft Beer Advent Calendar is Nøgne Ø God Advent. I've heard of Norway's Nøgne Ø before, but didn't really pay attention to them as none of their beers are generally available in Manitoba. However, as part of the Craft Advent Calendar, I get to try it! Appearance: Pours a murky muddy brown with a bit of a reddish cherry wood hue in there. A lot of creamy burnt caramel foam is rising from the glass as I pour it, but quickly goes down.. immediately. Aroma: Medium notes of roasted malt, giving it a bit of a coffee aroma to it. Dark chocolate, dark fruits, a bit of a woody finish and a hint of cream. Taste: Nutty, dark, roasted maltiness to give it a flavour reminiscent of stouts or porters - good for winter time. A bit of a boozey background.. which is not surprising seeing that it's 9% ABV! Hints of dark fruits, a bit of an acidic aftertaste. Overall Thoughts: For the first beer of the advent calendar, it's a good start - only 250mL, but while drinking this, it just seems like I'm actually drinking something 100mL more. Some dark fruitiness, a hint of grapes in the background, nuttiness, coffee and dark chocolate. De-cent.